Nupur Kittur moved to the United States from India in her twenties. In this two part interview, she talks about Indian food. We learn about kitchens in India, Indian customs, her thoughts on Indian food in the United States, and whether we should even be using the term "Indian food." 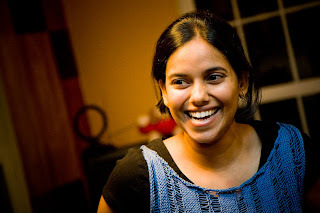 Nupur has been writing the popular food blog One Hot Stove for the past three and a half years. She plans to take a break from food blogging in August. She will be missed by many! When did you move from India to the United States? I moved here when I was about 22. I lived in India the whole time before that - in western India. I was born in Bombay and I grew up in a small town, about a St. Louis sized town, which is about an overnight journey from Bombay. Then, I moved to Bombay again after I finished tenth grade. I lived there for a few years going to college before coming to the United States. What is your first food-related memory? That is a really strange memory actually. It’s an Indian custom. I don’t know where it comes from. When you are little child, they have a little ceremony. They have a little pot of puffed rice, something that looks like Rice Krispies, and you have some berries in there and some sugar crystals. It’s this big pot of yummy stuff and they pour that on the baby's head. I don’t know what the significance is, but it’s a little ceremony. I remember having the ceremony with the neighbor’s kid who was the same age as me. I was really happy and alert and interested the whole time and he was crying his head off. We were toddlers, maybe a year or two years old or less than that. My family was a little different from most families in India. In most families that I grew up looking at, girls were sort of expected to learn how to cook as part of their growing up. Some of my girlfriends’ moms would say things like, “If you can’t cook, you won’t be able to take care of your family when you grow up.” But, I grew up in a family where nothing of that sort was ever expected of me: “Do what you like, cook if you like, not if you don’t.” But, it was a family that was always very interested in food. My mom was an excellent cook. My parents would collaborate to bake our birthday cakes. My grandfather was a dentist, but his family owned a bakery – this was way before my time - so I never saw that. But, they knew how to bake bread and cakes and all of those things and my grandfather helped my mom learn how to make cakes. The whole time I was growing up, my mom would bake a cake and my dad would sort of plan the theme of the cake and ice it/decorate it. It was such a wonderful thing that they did year after year. It was a household where food was really enjoyed a lot and it was never a woman’s thing or a man’s thing. It was just really enjoyed. My mom [who is a doctor] had this wonderful lady come in to cook lunch every day the whole time we were growing up (even now she does). The kitchen was sort of the center of the house, as it is for most households, I guess. We’d wander in and she’d be cooking and she’d say, “Shell these beans" or, "Shell these peas." We’d watch her and sit there and chat and then she’d give us little tidbits from what she was cooking. I never officially learned to cook. I just picked it up from watching my mom and this lady. I guess when I really started cooking was when I moved to Bombay and I was living with an Aunt, my mom’s younger sister. This was somebody who hated to cook and she had a kitchen that had absolutely nothing - she had no pantry. She would order take out all the time and we’d go out to eat. She had a great job, so she enjoyed not having to cook. I loved getting to go out. What teenager wouldn’t? But at some point, I just missed home-cooked food. I started cooking in her kitchen (just little things here and there) because I wanted to eat home-cooked food once in a while. That was when I really think I started cooking on my own, in my mid-to-late teens. Tell me more about these birthday cakes. Birthday parties are mostly a Western import in the last few decades - when you had influences from other parts of the world. That’s when the concept of the birthday party came about, with cake, candles, and balloons. It’s now typical that we have that in India as well. Most families that I knew of wouldn’t bake cakes at home even if they had a birthday party for their children, they would usually get the cake from a local bakery. But, my parents did it at home because they had this know-how of baking because the family had a bakery at some point a generation ago. Also, when my mom got married, her classmates from med school all got together and pooled their money and got her a nice oven, sort of a plugin tabletop oven. What is a plugin tabletop oven like? Indian kitchens don’t have built-in ovens like American kitchens. The tabletop oven is like a toaster oven. It is a device that you can place anywhere and plug in. A standard 9x13 pyrex dish wouldn’t fit in there. A cookie sheet wouldn’t fit in there. What would fit in there is like a round cake tin. She had a few little baking tins that she knew would work in there. There was no temperature control. You just plugged it in. It was just a metal box with a heating element that you plugged in and it had a little glass window at the top so you could peer in and see. It’s this aluminum thing that is so dented after thirty years of use, but it works. She still uses it! It’s put in a storage place in their little store room and she pulls it out a couple of times a year to bake something. Baking is not something that you do on an everyday basis in India. The recipes are all stovetop – you only have the burners. Most of the other things you see that you may think of as Indian food like the naans and the breads and the tandoori chicken or whatever, those are mostly restaurant dishes. Even in parts of India where they come from, you have communal village ovens rather than each home having an oven. This is from northern India where all of these tandoori recipes come from and they would have one big oven in the village, like the brick oven you use for pizza. It heats up to 800 or 900 degrees; the way your home oven never can. It’s a wood oven. Now, some people have their own ovens. But, the average person would not have an oven. If people can afford it, they can buy ranges that have ovens built into them (American style), or they can have what my mom does which is a stand alone oven that you can plug in and use whenever you need to - or she has something else called a tandori oven. Can you describe the tandoori oven? The tandoori oven is a vey funny device which sort of sits on your stovetop. It is sort of a container that makes an oven like atmosphere. It’s a cone that is on a flame. It has a dome so all together the space becomes likes an oven. Then, you can use that. It’s made of metal. It’s a very funny device, but it gives you that sort of hot space because it has the cone and the heat just comes up. You have a little mesh on top that you can place your food on and it has a domed lid which creates the air circulation with it on. Note: Live to Cook has a photo of the stove top tandoor. 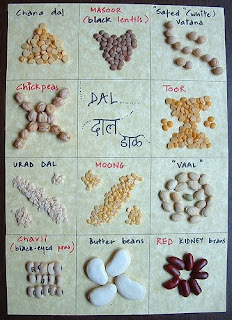 Nupur created this Gallery of Dals to demonstrate "the amazing variety; in size, from the wee moong dal to the gigantic butter beans; in color from the pale urad dal to the dark lentils; in shape and indeed, taste." What differentiates Indian cuisine from other cuisines? One of the main differences that really comes to my mind is that it’s not as heavily meat based. Indian food is based on grains and vegetables and beans whereas most cuisines that I’ve come across have meat as their focus and all of these other things as sides. Indian food is based on plant foods – it’s vegetables, it’s grains, it’s a lot of beans. Go into an Indian store and just count the number of different beans and lentils that you have there. In an American supermarket, lentils are just the brown lentils - there is just one type. Ever since Mexican food has come into the US, you have garbanzo beans. Some other types of beans have been introduced, but really you have very little variety. In India, every pantry will have 20 different types of lentils. How would you compare the flavor of Indian cuisines to that of other cuisines? Indian cooking obviously uses a whole variety of spices and seasonings, but so do most cuisines. I think in American cuisine and some European cuisines the seasoning is sort of salt and pepper. This is more unusual than the norm. There are so many herbs used in Mexico and in China. Indian food does have a great number of spices, but I don’t know about the reputation of Indian food as spicy food. I think that doesn’t make that much sense to me at all. For instance, in India, American food is burgers and pizza - it begins and ends with burgers and pizza. That’s not really the truth, is it? It’s just like that when you talk about Indian food being spicy – yes it is spicy, but that’s hardly what I would call the one defining characteristic of it, personally. How would you introduce Indian food to someone who has never tried it before? Whenever I have people over to dinner or lunch that haven’t had Indian food, my personal way of doing it (because I really think that vegetables are celebrated in Indian cuisine) is to ask them what their favorite vegetables are. Any vegetable that you name has a delicious Indian way of making it. If you are a person who loves western ways of bread, go try some Indian bread. If you love meat, go try an Indian form of meat. Go with what you really know and love and try an Indian way of making it and you’ll see that it may be similar and different all at the same time. I love Nupur and her blog and she has taught me so much! Looking forward to part 2 of the interview. As always, Stef, thoroughly intriguing. It's great to see Nupur highlighted, she does so much for making home-cooked Indian food so very do-able. How interesting. I have a friend who moved to India a few years ago I'm definitely going to turn her on to Nupur's blog! Thanks, Stef!